Turn left out of the Exit of Durrell along La Profonde Rue (M1). Turn left onto Rue de la Falaise. Turn left onto Rue de la Fosse. Turn left onto Rue de la Piece Mauger. Turn left onto La Profonde Rue (M2) and then continue on the road for lap two or turn left into the coach entrance after lap two. Turn right out of the Exit of Durrell along La Profonde Rue (M1). Continue right onto La Route de Maufant (M3/4). Turn left onto La Grande Route de Saint-Martin (M5). At St Martin’s Village, turn right after St John’s Ambulance and then left onto Grande Route de Rozel (M6/7). Turn left onto La Rue des Alleurs (M8). Continue along La Rue du Clos Fallu. 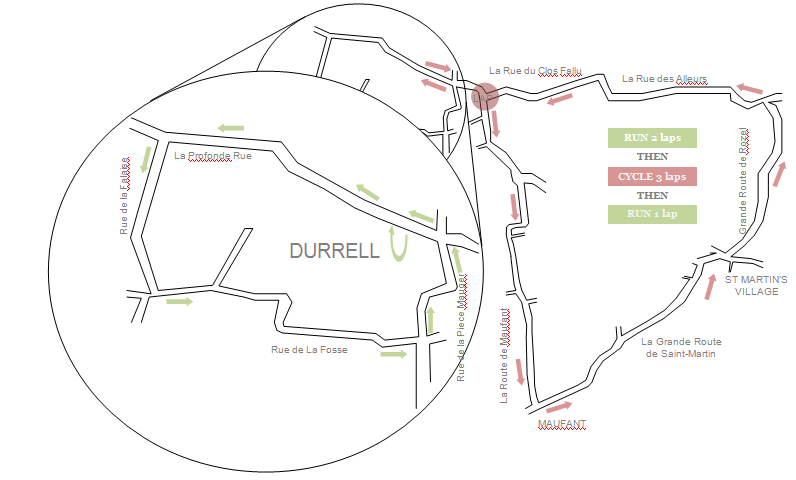 At the junction with La Route de Maufant (M3/4) either turn left to continue for lap two/three or turn right after completing lap three to return to Durrell. Turn left into the coach entrance and into transition (M1). As per the first run route, but only one lap.